This long weekend has been pretty great, especially after a weekend lost to being sick last weekend. I planned for a long run on Saturday morning but it didn't happen. On Thursday after work Carly and I did JillianMichael’s Ripped in 30. Friday morning I did some serious strength training, and then Friday night I spent just over an hour mowing the lawn. When I woke up Saturday I was in pain, especially in my thighs and ankles. I decided that extra sleep/repair would be more beneficial in the long term than pushing a long run. I struggled with the decision later when we drove by people exercising that morning, but I got over it eventually. I was also bummed because we had a couples massage planned for 11AM and I couldn't imagine a better post-long run experience than a massage! Fortunately, the massage got my legs back in shape for a long run on Sunday! We also went shopping on Saturday. I have been in the market for some running gear and I knew that the local running store might have Labor Day sales. I got LUCKY and got this pair of Brooks Pure Flow 2 for $70 (instead of $100! ), plus a new sports bra. I would have bought another pair of the shoes I currently wear but they didn't have them in my size. I haven’t tried them out yet and probably won’t until Saturday. I got up yesterday and did my long run. I liked Sunday better because there’s less traffic, although I usually plan my “cheat” day after a long run and I like “cheating” on Saturday because we usually spend that day out. Due to next weekend’s plans, I have my next long run scheduled for Sunday, but I might switch back after that. I did 6.5, hoping to aim for 7 next week. I ran slower than I have in a long time. I still finished 6.5 in 67 minutes, so not a bad time, but I can tell that I was out of commission for a week! After my run, a shower, and an incredible smoothie bowl we packed up for the beach! 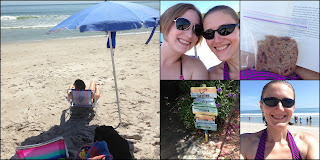 We checked out Melbourne Beach for the first time and we both liked it a lot. We got in the ocean twice and caught some decent bodysurfing waves. I also got some good beach reading time. It was a pretty perfect beach day. I brought a peanut butter and fig sandwich to eat with some side raw veg so that we could go to a seafood place for Carly’s lunch. We went to a place right on the water (river side), and she got her steamed shrimp. I was able to get a small salad and steamed asparagus. For dinner we made an amazing taco lasagna, recipe to follow this week. I wanted to share another recipe from this weekend. We did breakfast dinner on Friday night, which for me meant fruity pancakes. I can’t remember where I got the original recipe, but I have tweaked it a lot anyway. I also ate them for breakfast on Saturday! 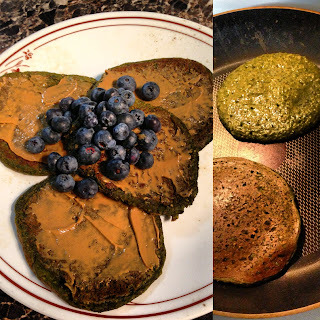 Combine flax meal and 1/3 C almond milk. Let sit for at least 5 minutes, if not 10. Next add the flax mixture everything else to your blender (if you have a crappy blender it might be better to add 2-3 at a time). Blend, scrape sides, blend until you get pancake batter consistency. Add flour or liquid as needed to get to the consistency you prefer. Heat your griddle over medium high heat. Pour 1/4 cup scoops of batter in the pan. These will take longer than traditional pancakes to set. I recommend using a non-stick pan or a good layer of coconut oil to fry them so they don’t stick. Mine took about 3-5 minutes on each side. 1. Use whatever milk and flour you have. 2. Sub sunflower seeds with another seed/nut of your choice. 3. If you don’t have protein powder or don’t use it, add extra flour or decrease liquid to get the right consistency. I’ve made these without and they come out fine. 4. 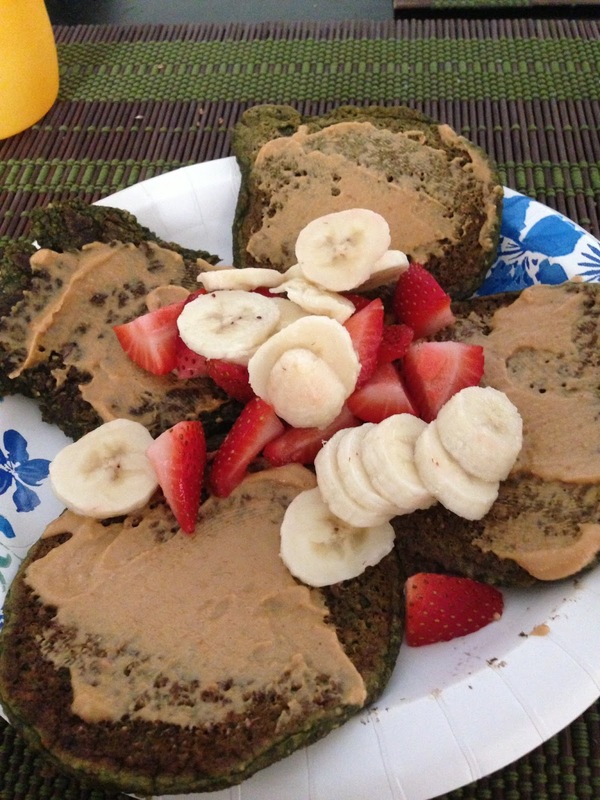 Feel free to add whole fruit to wet batter, but I prefer to top them with some nut butter and fruit when I enjoy. 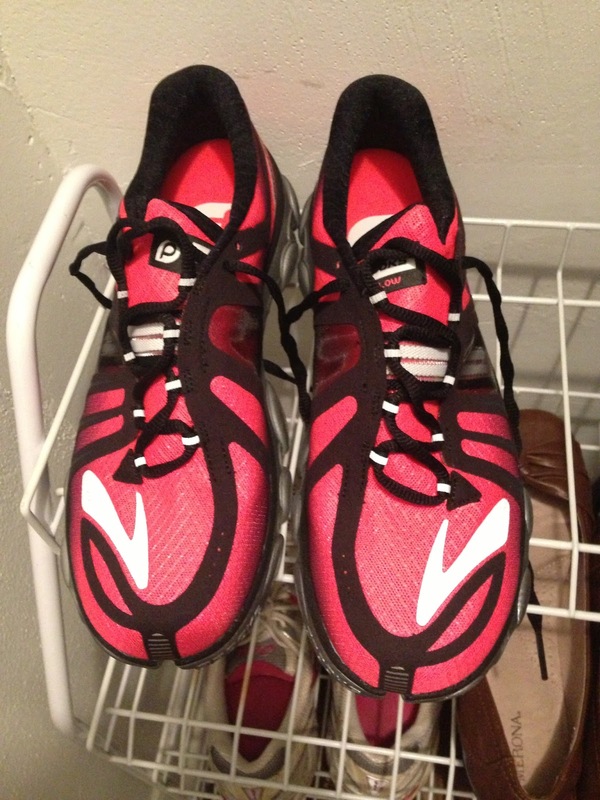 Hey, I just got those same Brooks Pure Flow 2 sneakers for my birthday! Love them so far. These pancakes look fabulous. I prefer to slather mine in nut butter instead of syrup too, yum, yum! Thanks for linking up to Healthy Vegan Fridays!